Newborn anti scratch mitts, delicate cuffs elastic band. 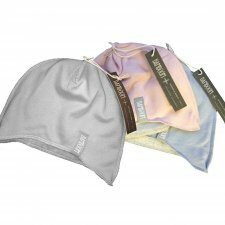 They will help protect your baby's skin by helping to control the scratching. 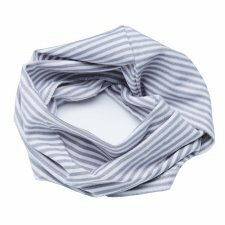 3 in 1: can be used as hankie, bib or bandana, closes behind the neck knotting the ends. Back closure with 2 position popper. Reversible model. Colours: pink + pink/natural white stripes or blue + blue/natural white stripes. Made of 100% organic cotton chenille, the reversible side is made of 100% organic cotton interlock. 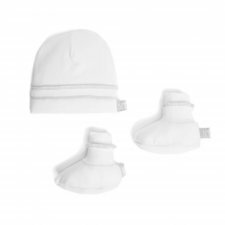 The cap lined in certified cotton-nicky offers ideal protection for the youngest. 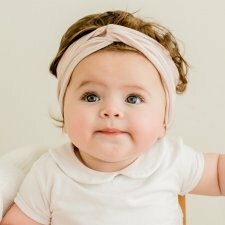 The human body loses about 30% of body heat over the head, so it is particularly important to protect the baby's head. 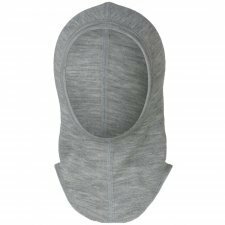 The two side seams ensure an optimal fit and avoid pressure points on the head. Two ribbons ensure a good hold of the cap. The cut-on earcups protect additionally. Colour: natural white, pink or grey. Baby gloves in organic bamboo. very soft and delicate for the sensitive skin of babies. Composition: 95% organic bamboo and 5% elastane. Bamboom products are fully made in Italy from Organic Bamboo and certified materials. 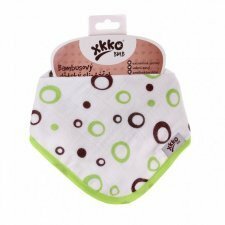 Baby triangle hankie, can be used as bib or skarf, features a snap closure (2 positions). 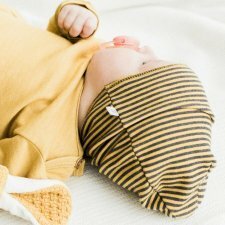 This hat is ideal for protecting the delicate head of a newborn. Perfect to use when you bring your little baby home from the hospital, but also during winter walks. They guarantee exceptional breathability! It is not recommended to put too heavy hats on small babies, because they would overheat the head. 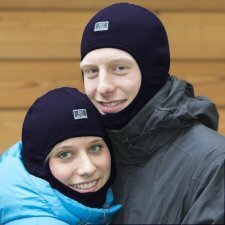 With this soft and breathable hat, it does not happen thanks to the particular fiber. An elegant, refined and pretty product! Available in grey, blue or pink. Two-ply light bonnet. With it the head is well protected from wind and sun. Highlight: One bonnet – two looks (just turn around). Cotton grown in colour. 100% pure nature for our babys'sensitive skin. Special native cotton seeds make the cotton flower grow in different shades - for a naturally coloured fabric, completely without subsequent dying. 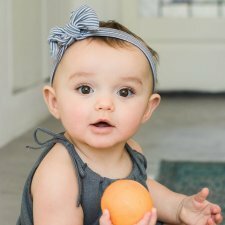 Hair Band is a beautiful accessory that cannot miss in the outfit of the child thanks to the beautiful tassel. Countersigned by fabric in soft and transpiring super bamboo, it guarantees the maximum one some comfort for the skin of child.The fiber of bamboo has unbelievable characteristic antibatteriche, anallergiche and it protects from the rays UV. Made of 95% bamboo and 5% cotton. One size. Colours available: stripe white/pink or stripe light blue/white. Set hat and slippers in soft and comfortable organic bamboo perfect for the first days of the newborn! Excellent fit thanks to the naturally elasticated material. 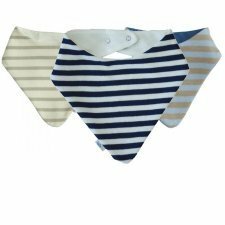 Keep your baby dry and clean with our cute Bandana Bib in two layers of fabric. 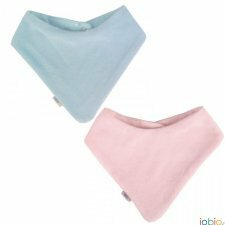 Top of organic cotton and backed with polyester fleece, ensuring that baby's clothes and chest stay clean and dry. Adjustable popper fastening. 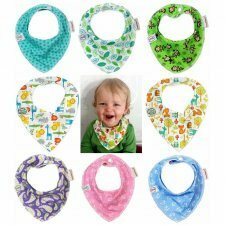 These practical and very soft three-ply bamboo bibs can be used either as bibs or scarves thanks to the pop fasteners. Color: white with blue and green circles. Color: white with lilac hearts. Color: white with lime bubbles. 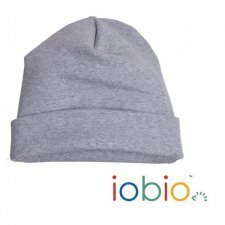 Beanie that winds with delicacy the head of child thanks to the soft fabric in organic fiber of bamboo and to the absence of seams inside. Colour: outside striped anthracite/grey, inside anthracite. Colour: outside striped ocher/grey, inside ocher. The woven into the cotton spandex allows optimum grip without ribbons. By flipping the fabric, the hood can also be adjusted in height, which allows an individual trastile. Made of 95% organic cotton and 5% elastane. Classic scarf (infinity) is a soft available scarf in unique ransom with different variations of color. It can be used both as neck warmers that as bandana. The organic fabric of bamboo allows the skin of child to breathe avoiding the perspiration and guaranteeing the comfort of it. Colours: azure or white/grey striped.